In my house is a 52m² apartment with two living / sleeping rooms for up to 6 people. The larger room is passage room for the smaller room. The apartment is Non smoking area. It has a separate entrance with, small kitchen hallway and a bathroom with bathtub. Not all the beds are suitable for adults - there are two bunk beds, the SEZ on a beach chairs. a place to sleep are close to the ground. Children are usually very enthusiastic about it. The larger combined living / bedroom is a walk-through room for the smaller room. My old mud house has low doors and is simple but functional. Many things are not standard, but built themselves and adapted to the rooms. I like to use ecologically compatible materials, the house is centrally heated with wood pellets and solar system and cleaned the wastewater in a reed wastewater treatment plant. Not everything is perfect, but comfortably furnished. The thick mud walls are sometimes a bit damp and so it is pleasantly cool in the summer. Often there are guests with dogs and also cats can come with in the apartment. If you are allergic to these animals, you should look for another place to stay. The large plot here is designed to nature. It also provides habitat for many animals - birds, lizards, frogs, toads, grass snakes and tree frogs even feel at home here. In spring and autumn many cranes rest on the surrounding fields, some are also in the summer. For my guests there is a covered seating area, a campfire site and above all a lot of green space. My guests can also relax with a massage or use a room for mediation. An organic farm in the village regularly sells its products, the nearest small shop is 8km away, for a larger shopping you should go to the 20km distant Prenzlau. Holidays with horses: Here are two small horses live in open stables and on pasture. For guests I try to work with the horses very individual. Children as young as three years usually have a lot of fun with horses and riding. But even adults (under 80 kg) can calmly gather their first experiences with horses. Fear is not a problem - everyone has time to familiarize yourself alone with the horses. Through a Aufsteigpodest easy to get on `horse. It always is not just about riding but also in contact with horses, you learn a lot about the welfare dealing with them. I offer more an introduction to the handling of horses and riding and no lessons or rides for advanced riders. The horses are used to Western style of riding. Therapeutic Accompany with horses is a part of the therapeutic riding, where the encounter with the horse and the benefit is used all its possibilities in the interest of the people. If you like, so you can combine holiday and promote each other. When riding almost incidentally balance and muscle coordination are improved. Many exercises on horseback help. You do not need any special riding clothes, sturdy shoes are only necessary when dealing with horses. Riding helmets are there. For people over 90kg riding does not work on my horses unfortunately. Relax with a massage: For my guests, I offer spa massages. Also, I have received degrees as a nurse, social worker and Therapeutic Join with horses. Holiday with your pet: pets are welcome here - it may be several dogs. Which may of course in the apartment and the property is well fenced. My little dog is happy to visit other dogs, occasionally I also take in dogs. So it goes without saying that I also look after their dog if you want to go without him even more. A covered dog kennel can be temporarily used. Indoor cats can come into the apartment, small animals are also possible. For guest horses a pasture accommodation is possible. In the beautiful Uckermark there, especially for nature lovers much to discover - open fields, forests and beautiful lakes are ideal for walking, cycling, swimming and boating in. In two hours you can also be on the Baltic Sea or in Berlin, to the very clean Feldberg lakes it is a good 20km. Die Wohnung ist urgemütlich eingerichtet, die Umgebung ist idyllisch. Es war sehr schön. Die Kinder hatten viel Spaß mit den Pferden, Hund und Katze, die Vermieterin ist sehr nett und freundlich, der Vogelzug in der Umgebung beeindruckend. Alles in allem hat es uns gut gefallen und wir kommen gern wieder! Die Ferienwohnung liegt sehr ruhig in einem kleinen Dorf und wir verbrachten hier schöne und erholsame Tage. 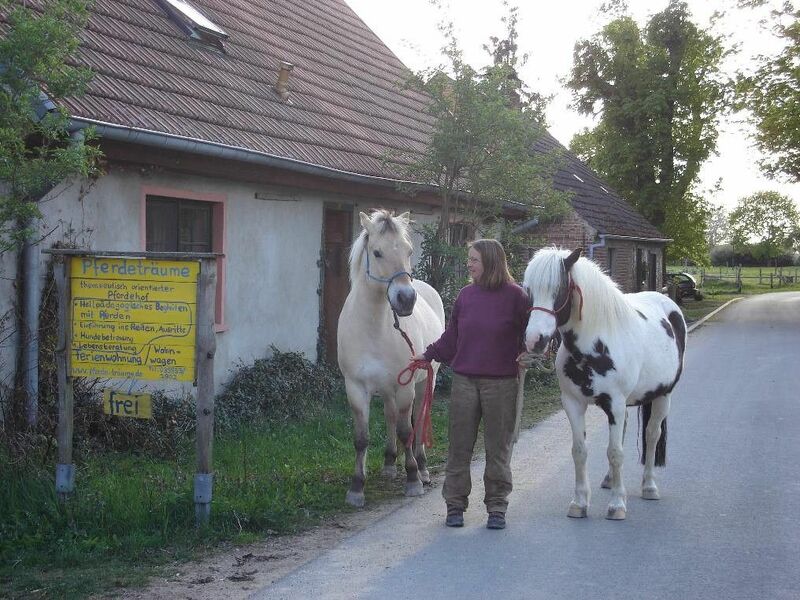 Unsere Tochter war begeistert vom Reiten auf Merlin und Luna und auch das Hinausbringen der Pferde auf die Weide und das Flechten der Mähne fand sie toll. Die Vermieterin ist sehr nett und hat uns schöne Freizeittipps gegeben wie z.B. die Besichtigung einer Alpakafarm mit anschließendem Besuch eines Cafes und einen toll gelegenen Waldsee zum Baden. Angela Schuberths kleines Lehmhaus ist gemütlich eingerichtet und es gibt einen Zugang direkt zum grünen Innenhof mit Tisch und Stühlen. Uns hat es dort sehr gut gefallen. Wer es allerdings super klinisch sauber braucht, sollte lieber woanders übernachten. Die kleine Hündin ist lieb, aber springt gern an Leuten hoch. Aber Angela achtet sehr darauf, dass sie an der Leine ist, wenn bpws. Kinder Angst haben sollten. Also kein Problem! Die drei Pferde sind wunderschöne und freundliche Tiere und der Garten mit den vielen Obstbäumen und der Feuerstelle ist einfach für Naturliebhaber eine wunderbare kleine Oase. Gerne wieder! Sehr Tier- und Kinderfreundlicher Umgang! unsere osterferien in der uckermark haben uns sehr gut gefallen. die kinder sind jeden tag eine stunde geritten, und auch sonst bietet das dorf das volle landleben mit hunden, katzen und huehnern. nette gastgeberin, schoene landschaft, frische luft ..... was will man mehr als stadtbewohner? Die Unterkunft ist perfekt, wenn man ein Ruhe und Entspannung sucht. Rund um das kleine Örtchen gibt es viel Platz für ausgedehnte Spaziergänge. Perfekt, um dort Zeit mit Hund zu verbringen. Der Vierbeiner kann sich hier rundum wohlfühlen. Die Unterkunft ist rustikal und gemütlich und bietet alles was man braucht. Wir haben uns wohl und willkommen gefühlt. Augustfelde is a small village with about 40 residents. It is surrounded by open fields with some ponds. Forest and a lake are very close. You can enjoy holidays away from the tourist crowds and get a lot of offers in the region here. So the beautiful Feldberg Lakes is about 20 km away. There load crystal clear lakes for swimming and boating. A day trip to the Baltic Sea or Berlin from here is not a problem. But Bocce there is much to see - you can find in the apartment much information. If you want to do something with the horses here, I ask for a call - 039853 2902. This is the quickest way to clarify whether their expectations match my options. People under the age of 80kg, who are more likely to want to get their horses first, are more likely than children who regularly ride elsewhere and expect it to be similar. I often go on small rides with the kids on the guided horse. Otherwise we usually do something on the lunge, unless there are good riding skills available and possibly in the Western riding way. Hier können Sie ohne Mindestaufenthalt Urlaub machen. - Kinder bis zwei Jahren frei - Haustiere einmalig 10€ - Bettwäsche/Handtücher und Endreinigung sind nicht im Preis enthalten - können sie gerne selber mitbringen oder hier bezahlen BW/Handtücher 5/2€ pro Person, Endreinigund 15€ Heilpädagogisches Begleiten mit Pferden oder Reiten - Ab 10€ pro 30 Minuten für Geringverdiener (Selbsteinschätzungspreise) Massageangebote: Rückenmassage 30 Minuten 22€. Fußmassage 30 Minuten 22€. Ganzkörpermassage 60 Minuten 40€. Hot Stone Massage 60 Minuten 45€.